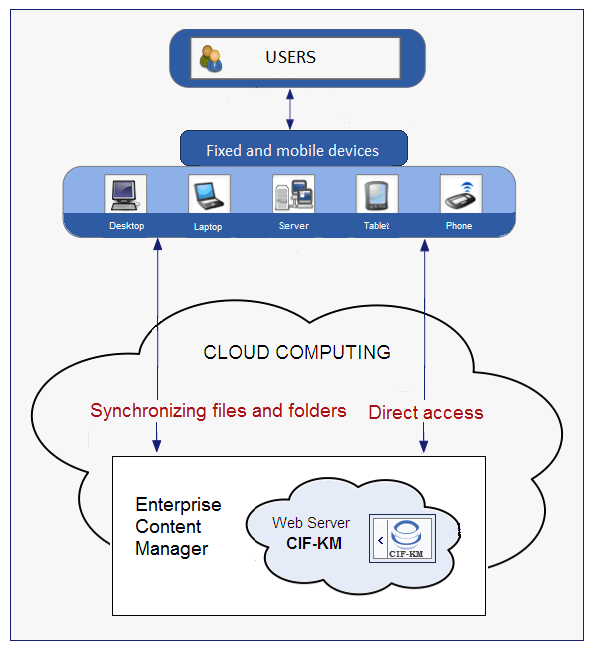 Any version of CIFKM (standard or custom) can be installed on physical servers (hardware) or virtual servers in the cloud (Cloud Computing). In the cloud, apart from disk space to store files (Dropbox, Google drive,..) one can contract virtual servers that are controlled by a simple console, for whose configuration one can authorize third parties like our Company CIF. Being in the cloud means mobility, security, scalability and elasticity, ie the possibility of dimensioning the required services to what is needed. This includes the scheduling of periodic necessities, not having to worry about equipment and technologies, about maintenance and repairs, the purchase of equipment , all of which is handled by the service provider. One only needs an Internet connection. 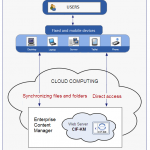 If one uses multiple bidirectionally synchronized servers by Internet, it may be advisable to evaluate the architecture with a master server in the "Cloud", as is shown in the figure. The provider of cloud services that CIF uses for its internal use, and for tests and demonstrations, is "Amazon Web Services EC2" (Elastic Computer Cloud). One can test the standard version of CIFKM, without installing it in any server of your company, in a CIF virtual Web server in the cloud (whose service provider is Amazon EC2) via "Test CIFKM in the cloud". A test instance of CIFKM with its data base will automatically be created for you in the cloud. To contract the service of a cloud server and install the application to your specifications do not hesitate to contact us if necessary (the installation will take about 1 hour, the cost of 1 service ticket).